Kuklík city belongs to the family Rosaceae (Rose). Is also popularly known as Benedict, Brantovník, Hare eye. It is a perennial herb with oblique, nevětveným and up to 2 cm thick rhizome, which grows from the ground rosette of leaves. These sheets are called shortly petiolate and přetrhovaně lichozpeřené. It occurs in many different places - in the bushes, on the edges of forests, parks, gardens, old and elsewhere. We can bump into him all over Europe except Iceland and parts of Scandinavia and the lowlands of northern Russia. Grows well as elsewhere in the world - in some parts of Siberia, the Caucasus, North America and Australia. Used part of the rhizome, which is gathered in the spring or autumn. The active substances are contained tannins, phenolic glycosides (eg eugenol glycoside geosid, which is slightly toxic), essential oil (eugenol), volatile oil, resin, bitter, and flavo rubber. It is reported that leaves Kuklík has antidiarrheal, stopping bleeding and reducing the temperature effect. In folk medicine has been recommended in diarrhea , cramps , uterine bleeding, cramps associated with gastric ulcers . Laboratory test has been shown to effect blood pressure lowering . Externally it is used for inflamed hemorrhoids and skin inflammation . So far no description of any side effects or interactions. 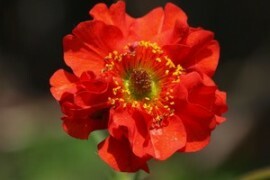 Replacement is possible with Kuklík potočním (Geum rivale), which has similar effects, but is considered weaker performers. It is much less abundant than Kuklík urban, grows in wet places along streams, in bog meadows, spring. It differs overhanging reddish flowers with yellow or brown tint. Rhizomes Kuklík smells like cloves and are used only as an additive to food, but also in the production of liqueurs and beers. White wine supply natural flavor vermouth. It is therefore no coincidence that Russian folk name means KUKLIK clove root. This is due clove aroma, which is caused by the essential oils contained eugenol. Extract from Kuklík city is included in preparations Deviral or elixir pancreas .